During camps, kids will use acrylic paint, learning technique and color mixing while having a blast! We complete a painting each day, that is scheduled on our calendar, face paint, play games, have lunch and more! Kids will make bonds, get to use their creativity, and imaginations, and just be a kid in a fun, safe atmosphere! Lunch is available during kid's camps for an additional $6.00 for pizza, dessert, and a drink. Or pack your child something from home! We use actual punch cards, one punch per child for a Kid's Class. We immediately punch the card for entry to the class. Punch cards can only be shared for multiple kids withing ONE FAMILY! Please call POSH at 303-442-7674 with your suggestions and comments. Every child loves to paint and create. We supply all materials and lots of zany fun with age-appropriate painting projects. Our supportive staff and fun art keeps the party exciting and produces results that are inspiring for both kids and parents. 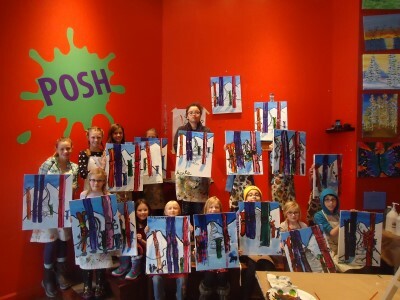 POSH Art Parties are easy for parents, fun for kids, and produce a lasting impression. Each child leaves with a canvas with their original art - the best party favor ever!! Our art teachers are awesome with kids and have an extensive background teaching children. The cost includes all materials and a professional artist that leads painting activities. Just bring the cake and ice cream! We require at least half of the $250 up front as the deposit and then the remaining balance on the day of the class. $40 extra for a custom painting that matches the theme of the party! Time for the kids to explore different materials, work together and independently on art projects, and most importantly have fun! All groups facilitated by an art therapist, who is there for support, guidance, and assistance during the art making process. The kids will be able to use different materials like sewing, clay, beads, paint, collage, and more. 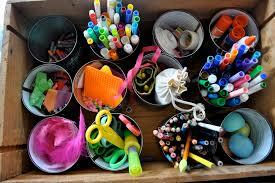 A place for them to experiment, play, and just be a kid surrounded by art materials at their disposal! New art experiences each week. Each family will work together to create one work of art during the session. Call Posh today to book your event! We look forward to painting with you! !